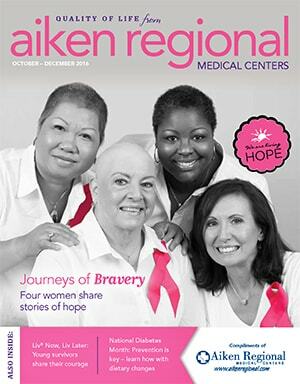 "Fighting Breast Cancer Became My Job"
Determination, faith in God and positive attitudes helped these four survivors after getting diagnosed with breast cancer. Care you can trust, close to home. CCIC is dedicated to meeting your individual needs so you don't have to travel far to get the treatment you deserve. When the need for surgery arises, you want to feel comfortable with your surgeon as well as the facility. And from pre-op testing to postsurgical recovery, Aiken Regional Medical Centers has you covered. WE Encourage Young Women to Live NOW. Live LATER. Young breast cancer survivors share their stories.